James Harris Gallery | Xavier Toubes: "PushMoon2: Figures with Shadows"
James Harris Gallery is pleased to present our first solo exhibition by Chicago based artist Xavier Toubes entitled, “PushMoon2: Figures with Shadows”. 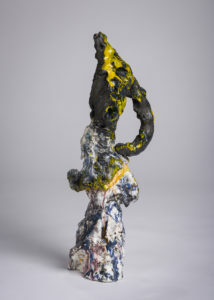 Working in ceramics for over 40 years, Toubes’ artistic practice is one of constant discovery and abandon, always approaching the material with a sincere curiosity for the core philosophical questions around human existence. For Toubes, being an artist is “a way of understanding and being in the world, a tool to knowledge.” In this recent body of work, the artist revisits forms he has been exploring for decades. But as everything in life, each interaction marks a new experience that informs meaning in the present. 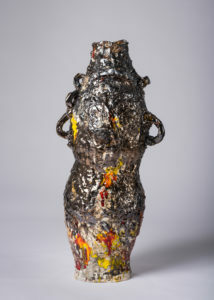 Toubes’ work is about relationships, on ongoing dialogue between artist, object, and context. 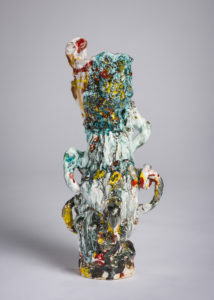 The alchemical nature of ceramics and his process of multiple glazes and firings keeps this interaction open-ended and without preconceptions. In this way, Toubes allows the work to unfold intuitively, relying on the material and his artistic sensibility. The objects he creates reflect this raw intimate interaction, imbued with animate qualities that appeal to the senses and reactivate each moment like a performer on stage. The show includes a series of works entitled PushMoon2 that is reminiscent of his Bichos series included in a group show at the gallery last year. Both are part of an ongoing development of his conceptual work he poetically calls Figures with Shadows. In this work, the artist engages in an unrestrained process of creating multiple permutations of sensual biomorphic forms to investigate notions around performance, authenticity and identity. Toubes often references dance as an inspiration in his work, an art form that is concerned with the ephemeral physical experience rather than a particular outcome. The contorted shapes of PushMoon2 evoke a visceral dancelike movement that hovers between agony and eroticism, beauty and decay. These in-between states parallel how the artist defines his own identity and artistic practice, as a nomadic and ever changing process of becoming. Originally from La Coruña, Spain, Toubes has lived and worked throughout Europe, the United Kingdom and the US. He has navigated through different cultural perspectives, materials, ways of working, economics, politics, and expectations. This complex experience of identity based on difference and constant evolution is portrayed in the endless inflections that are imbedded in the richly layered surface of these glazed sculptures. 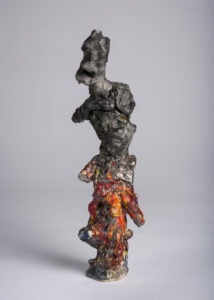 Toubes suggests that these clay figures have an inaccessible interior beneath the mask like forms he fastens to top portion of many of these works, symbolic of his own human experience. As he describes, “My intent and motive as a sculptor is to give shape to the invisible, with something as rudimentary as baked mud.” In this way, the intangibility of these ephemeral art objects is what offers access to the immaterial beyond, where potential for being is endless. 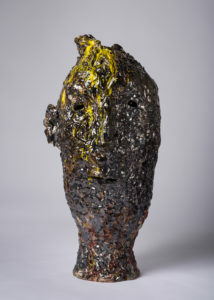 Also included in this show are two large head sculptures and a vessel. 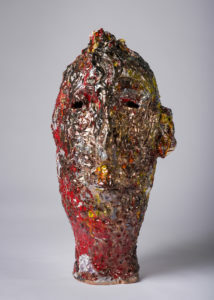 The colossal head is a form that Toubes has return to many times, producing several series of these works periodically over the past 30 years. 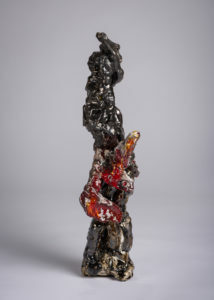 The fragmented heads with their distorted features and raw melted skin glaze bring to mind the grotesque painterly figures of Frances Bacon, an early inspiration for Toubes. He also looks to the world as imaged by the early 20th century cubists Pablo Picasso and George Braque, who observed that there were no objects only relationships. This perspective resonates in a contemporary context, which for Toubes speaks to the fragmented quality of a lived experience, an autobiography of the displaced. For these works, time and space are non-specific, and instead suggest the conceptual landscape of the mind where the archaic and the modern share site with the local and the universal. The luster enhanced surfaces with gold and silver overlays comment on the transformative nature of life, and the cycle of decay and regeneration. In this sense, there is no end to this creative endeavor where the process of rediscovery and evolution is in itself the subject of his work. Xavier Toubes (Francisco Javier Toubes Vilariño) was born in La Coruña, Spain in 1947. He attended University of London Goldsmiths’ College (1974-7). After graduating with the Master of Fine Arts from Alfred University, New York, he taught in the Art Department at the University of North Carolina at Chapel Hill until 1993. 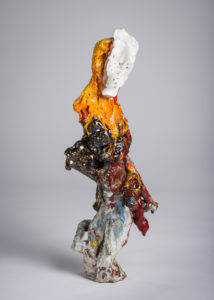 In 1989 he become involved in the creation of the European Ceramic Workcentre (EKWC) in ‘s-Hertogenbosch, the Netherlands, and was the Artistic Director from its opening in 1991 until the autumn of 1999 when he started teaching at the School of the Art Institute of Chicago. 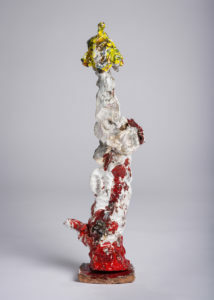 Exhibitions and work in public collections throughout USA, Spain, Switzerland, Portugal, Korea, Finland, China, Taiwan. 20" x 9" x 6"
31" x 9" x 7"
29" x 9" x 9"
31" x 11" x 10"
31" x 11" x 7"
43" x 20" x 18"
42" x 18" x 19"